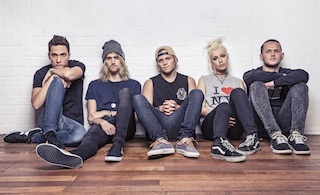 Footage has surfaced online of Tonight Alive vocalist Jenna McDougall defending a fan from being choked by security guards at the Brisbane stop of this year's Soundwave Festival. “After audience members apparently jumped the barrier to approach the stage, security took harsher than expected measures against the crowd, allegedly crash tackling and, as seen in the below video, pinning one man to the ground. Security eventually release the man, before McDougall apologises, high fives her fan and embraces him.